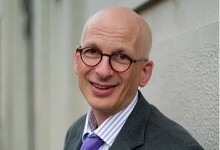 A One-Minute Interview with Seth Godin about the hard work of digging deep inside yourself and making a difference. Looking fear into the eye and connecting with people. We can do it every day, although it feels safer not to. In his most recent book Linchpin: Are You Indispensable? , Seth Godin takes you on an search through the hidden sides of … yourself and what you are capable of – if only you were not scared. Godin – who is an outsider to the psychoblable literature and doesn’t get caught into therapy language – talks about putting passion into your work. A linchpin is the person who is indispensable, because they refuse to become an interchangeable part, someone who merely follows the manual. In the hardware store, the linchpin is a lightweight little piece that holds the wheel to the axle. In the below one-minute interview, Seth Godin talks about one of the key-concepts of a linchpin: emotional labor. You can also have a look at the wikipedia definition of emotional labor and you will find that this is one of those terms that get blurry the more you try to analyze and dissect them. My take on the subject of emotional labor is that it is that part of your work where you make a connection and a difference for the recipient of your work. We spend the time and energy trying to perfect our craft, but we don’t focus on the skills and interactions that will allow us to stand out and become indispensable to our organization. To Be Or Not To Be (A Linchpin)? In Hamlet, Shakespeare wrote: ‘There is nothing either good or bad, but thinking makes it so’. In the same way, one could say that there is no such thing as a dead-end job; but the lack of emotional labor ‘makes it so’. In every job there’s a chance to lead, to make change, to connect and to create tiny breakthroughs. The study of hospital workers by Amy Wrzesniewski, that I mentioned in the previous article of this series, showed this very clearly. Bringing love to work when I and my peers don’t feel like it. That is my job. And the people who do that the best keep getting rewarded for it. Hospital workers don’t get to whine about their hurting backs or mopping up vomit day-in day-out. White collar workers like us shouldn’t whine about how hard it is to be generous and creative and flexible. To Stand Out Or To Fit In? Finding security in mediocrity is an exhausting process (…) but if you do great work you gain the reward of knowing you’re doing great work. Your day snaps into alignment with your dreams, and you no longer have to pretend you’re mediocre. Emotional labor is pulling ourselves up to stand out instead of repressing ourselves in order to fit in. This requires you to lean into whatever you are doing instead of just standing by. Art requires the emotional labor of doing something difficult, taking a risk and extending yourself. By explicitly using the word ‘art‘ Godin challenges his readers to think about their work differently. Your labor is no longer an interchangeable commodity. It has become art because it changed the recipient of your work. When you are a customer service rep, a consultant or a team-leader and you elevate each interaction to make a difference for your recipient, you are an artist. The art you created exists by virtue of the enormous emotional and professional risk you have taken. It takes gut to bring more humanity to your work, instead of more rules.